Linde North America is a subsidiary of The Linde Group, which designs and operates hydrogen vehicle fueling systems. AC Transit is the bus operator for 13 cities in the East Bay Area, including Emeryville, Oakland and Berkeley, and also operates trans-bay service to San Francisco. The Emeryville hydrogen fueling station, which began operating in late 2011, is one of two Linde is supplying to AC Transit. The second, located at the Oakland operating division, is expected to begin operating in 2013. According to Linde, replacing diesel with hydrogen fuel rids the air of vehicle tailpipe emissions. Elaborating on this good news, the California Air Resources Board estimates that fuel cell buses will deliver a net reduction of 2.7 pounds of carbon dioxide per mile using hydrogen reformed from methane, and 6.3 pounds per mile using hydrogen derived from solar, wind, or other renewable sources. Each bus is projected to travel 36,000 miles annually, reducing carbon emissions by 44 metric tons per year when using methane as a source of fuel, or 103 metric tons using renewables. David Armijo, AC Transit’s general manager, believes the significance of its new Emeryville hydrogen station shows the viability of fuel cell buses. Of note, this is the first public hydrogen fueling station in the San Francisco Bay area. The station meets industry needs for fast fueling and includes both 700 and 350 bar fueling and meets the Daimler requirement of a three-to-four minute complete fill with a delivered gas temperature of -40o C. In addition to fill performance, the station reliably demonstrated the capability to fill four fuel cell vehicles back-to-back,” said Rosario Beretta, general manager, Mercedes-Benz Research & Development North America, Inc., who is responsible for Mercedes-Benz fuel cell vehicle operations in North America. 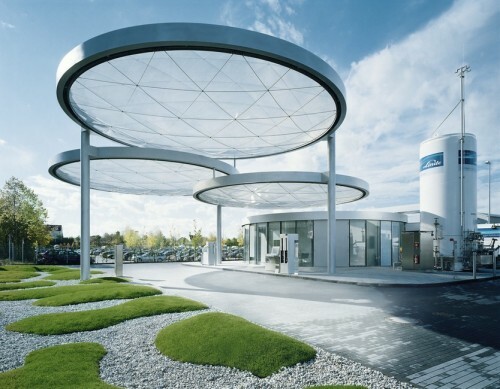 A video news release of Linde’s hydrogen fueling station also is available at You Tube.